We take a lot of risks. Not just professionally, but in a general safety sense. We walk across busy streets, we hustle down stairs, and we drive 2-ton metal monstrosities at 70 miles an hour. And that's just the usual. Safe to say it's easy to discount just how important safety is. Or at least Vince Poscente thinks so. He's a former Olympic Skier, Himalayan Expedition Leader, New York Times Bestselling Author, and he played clarinet in high school. And today on a brand new episode of Power Up! with NSA North Texas, Betti's sitting down with Vince to get to the bottom of what exactly safety means to people - and why we keep forgetting about it. But what exactly does "Radical Safety" mean? How has Vince made a business out of it? And is the secret to staying safe as easy as reshaping the way we think of safety? Vince Poscente’s signature wit and wisdom combine with his perspective on the neuroscience of safety for a message you won’t soon forget. 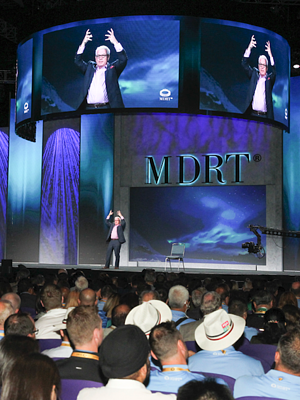 As Founder of Radical Safety, LLC, Vince travels the globe weaving a message of safety performance and minimizing operational risk by challenging each audience member to embrace a zero-incident mindset. In this podcast, Vince delivers a fresh and high-energy perspective on Clarity, Commitment, Consistency, Confidence, and Control. This is the backbone of his entertaining, educational and motivational Radical Safety message to improve your existing safety competency model. 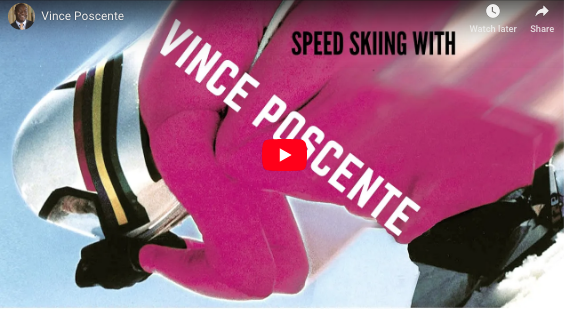 Jamaican bobsledder, Olympian and professional speaker, Devon Harris interviews Vince Poscente, motivational keynote speaker and speed skiing competitor in the Olympic Winter Games. His Podcast Interview from Keep on Pushing is transcribed here. keep having fun along the way. DH: Hey Guys, this is Devon Harris. Welcome to Keep on Pushing Radio and of course I am your host. And this is where we share….work to share insights and ideas that are going to help you to Keep On Pushing and live your absolute best life. So look man, if that's something that you're even remotely interested in; guess what? You're in the right place man and we have an amazing guest today that I think you're going to find a lot of value in right? So I think he is one of the most accomplished persons that you'll ever meet. I'm not even sure where to start you know! In my mind he's a crazy guy because, he Speed Skis. I mean who does that? Well obviously he does right? This guy went from being a recreational skier to competing in the medal round of the 1992 Albertville Olympic Games in four short years! I mean that is pretty remarkable. And today he is one of the most in demand motivational speakers you'll ever meet you know? He gets a chance everywhere, anywhere he gets someone who wants to listen to him. To share his insights on extraordinary goal acceleration. He talks to people about being resilient and you know overcoming obstacles. And obviously that's not from reading from a book that's his life. Those are his experiences right? He's an award-winning sales and marketing executive, formerly with the world's largest real estate investment firm. The guy is an award business owner, he has a Masters in Organizational Management. He is inducted in two Speaker Halls of Fame. Actually, he is one of only four people on the entire planet inducted into both the Canadian and the USA Speaker Halls of Fame. He is a New York Times bestselling author. Seven books. And in his spare time, he finds time to lead or participate so far in six expedition to the Himalayan mountains. I'm so happy to have Vince Poscente on Keep On Pushing with us today. VP: Devon it's a treat to be with you. Thanks for bringing me on your show. DH: Yeah man! It's great to have you. I have to tell you a story, I want to start with a story about you that you don't know. DH: Go figure, so it's 1997 and I'm in Park City racing and qualifying for the Nagano games in Japan 98 right? And, you know I had intentions of becoming a motivational speaker after the Olympics. So the people I was working with… I'm like hey after the games I want to be a motivational speaker. So I am in my room in Park City and my agent at the time comes in my room, and he sticks a V.H.S. into the V.C.R. So you know obviously it's like 100 years ago… it's old technology right? DH: On the screen is a motivational speaker, some guy called Vince Poscente on a chair. You were mimicking the start a of a speed ski race and my agent goes can you do that? I am like yeah, I could do that! DH: I go to the Olympics and I get back and I started speaking. So yeah Vince, you have been part of my speaking career from the beginning. VP: That's great. That's why we do this. DH: Yes! Yes! Indeed. So how did you yourself get started in speaking? And I was saying whoa! This is kind of fun. But anyway, I ended up being a valedictorian for high school. And speaking to 2500 people and I really for some reason, you know how there's something burning inside you? Think I just got to do this. I just have got to do this. VP: And it was it was not about the attention it was about a sense of needing to contribute. To give people hope, to give them direction. To say hey you know, grab it you know, make it happen. And then over time from that speech and the graduation speech to probably the Olympic Games. It always kind of stuck in the back of my mind. In fact I saw a politician speak to 5000 people in our province of Alberta. His name is Peter Lougheed and he captivated the audience and I went that's it! I want to be a politician. [laughter] I dodged that bullet. I decided that maybe politics didn't have to be the venue to speak. When I was racing I thought hey, if I win this gold medal you know I could be a speaker. I didn't win the gold, I mean it wasn't even remotely possible it seems looking back. Because I had people that have been racing since their whole life. I ended up being ranked top 10 in the world, but in the finals in the Olympic Games I placed 15th. And it was 18 months after that I started looking at the speaking business. I have a saying that, ‘A good idea won't go away.’ And so the speaking thing kept popping up and popping up. So I eventually poked around went to the National Speaker's Association convention in Washington D.C.in 1994. Two years after I competed in the Olympic Games, and that was really the beginning of it realizing how good professional speakers were. I mean there are a lot of people who say hey I would like to be a speaker, maybe they're good at giving toasts at weddings. But I'm telling you, to be a professional speaker is a whole different deal, as you know. DH: Yeah! Yeah! I get that all the time as well. People go… oh you're a speaker! How do I get into that? Right and it sounds like oh it's a hobby that they want to pick up, they don't recognize you know the level of expertise. And on that note, I mean how do you find as an athlete right? You found the correlation between your athletic career and your speaking in terms of you know preparation, technical stuff and working on your craft you know. Finding sponsors as a speaker, as an athlete finding clients. Are there any correlation? And how does that experience you think impact your other businesses as well? VP: Right! Yeah! 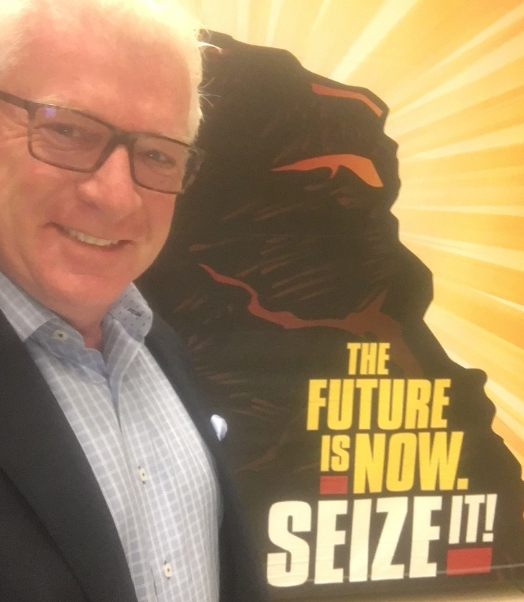 I look back over what got me from recreational skier to the Olympics in 4 years, is the exact same formula that I used to get in the speaking business. And, in a nutshell, it was five C's. It was Clarify where you want to go. Have that emotional connection, when I started I was not very good. The second C is Commitment. We all know what commitment is. Because you can say “yeah I'm in” and you put your money down or you give your word. But it isn't until you get into it you realize the level of commitment necessary. So that didn't surprise me when I got to the speaking business. Just to raise your level of commitment that is necessary. The 4th C, Consistency, is something I learned from sports. A lot of athletes and people in business for that matter try to do what the competition’s not doing. But I found that when you do what the competition's not willing to do it's a game changer. What I learned in sport, in order to compete for Canada or the United States, or other countries for that matter, there are Olympic qualifying standards. In Canada it's either you have to be either top half or top 16 in the world. I figured that I had to be not do what the top 16 in the world were not doing, that's impossible. They have been racing since they are four, five years old. But I could do what they're not willing to do, and so in the speaking business I did the same thing. I looked at the top speakers and what are they not willing to do. You do that consistently - that's a game changer! VP: And then the fourth C: Confidence. You know if you're not confident in sport, no matter what skill level you have, if you don't have the necessary level of confidence you won’t reach your potential. The same goes for speaking. If you stand on a platform, a whole bunch of confidence is necessary. The fifth C: Control. As an athlete or a speaker I realized you can't control the environment. You can't control the audience, or in sport, you can't control what you're stepping into. But you can control what you bring to that; meaning be deliberate about the routines prior to any ‘race run,’ speech, negotiation or anything that requires your very best performance for a desired outcome. I used the same 5Cs in writing books and ended up on the New York Times bestselling list for that reason. Remember - Clarity, Commitment, Consistency, Confidence and Control. DH: Yeah! Obviously it has worked and the important point here, our lesson here I think for all of us is that these C's. These five C' aren't just a one time thing. It's an on going thing right? You clarify your vision but that vision keeps you and pulls you and gets you to go. Commitment is not just ok, I am committing. You literally have to commit every single day to that vision that you have clarified. As you do that consistently obviously you raise your confidence level and that allows you to control as you say what you bring to the table. So awesome. I guess I have to ask you man! Are you an adrenaline junkie? I mean, I read that you hang-glide, sky dive, swim with the sharks. I mean apart from the fact that you get a rush of adrenaline when you do these things. Are there any other similarities? And again, I'm always curious about the lessons that we can take from our respective experiences and apply to all the areas of life. VP: Devon the optics of it are; Yeah I am daredevil or an adrenaline junkie. But the truth is, what really drives me is, if there's something that causes fear I want to supersede that. There's no better feeling for me to supersede fear. It doesn't have to be a speed thing or an adrenaline thing. It could be shoot! I could see somebody I want to talk to, talk to at a party or a meeting or something. I go, oh shoot! Maybe they're too busy or whatever. I say to myself, Wait! That's fear. I have a healthy distaste for fear. Fear drives me bananas so to supersede it, to become bigger than the fear is something. That's what drives me, that's what I get turned on by is to overcome fear. DH: Yes! That makes absolute sense. They say, “Do the thing you fear and the death of fear is certain.” So as you take your fear head on as it were. You gain control over it you. So I also read that you were a luger at one point and that you go down essentially a bobsled track sticking your feet miles at 80 mph. DH: How did you then transition from that to speed skiing? VP: I luged for a couple years, but I quit. I luged over in Lake Placid. Have you ever bobsledded in Lake Placid? I'm sure you have. DH: On the old track. DH: We survived. We belong to a very elite club. VP: Yes! Oh Goodness! Well luge, I learned about visualization and imagery. But I also learned that if you don't commit. If you don't really step into something that's not guaranteed and again it was that fear thing I guess overall. I quit luge and I watched buddies of mine marching in the opening ceremonies in Calgary. VP: And I went… you know what? That's never going to happen again! I am never going to have that feeling of the regret that I did at least try. DH: I think I read that you allowed your coach to dissuade you from continuing luge. Said you were not going to be good enough, you wouldn't make it. So, you believed him? DH: So yeah, so you got a good taste of that pain of regret. VP: Yeah! Yeah! You can get an outside voice that says it's not going to happen. And then you go oh well, you are an authority you would know and I'll believe you. We hear countless stories of people saying that may be a motivation for some people. For me, I was like, Oh ok, good point. But that regret is something I never going to happen to me again, EVER! DH: People get motivated by a number of different things and I think one of them is you know, having an experience that you never want to experience again. And an event you never want to experience again. Kudos to you because there are people who you know, I think all of us have regrets of one kind or another. And people have been man I wish I had invested in that stock, or taken that job or not taking that job.Wish I had asked her to marry me. Or gone out on a date or that kind of stuff right? It doesn't work out all that well and people beat themselves up. But kudos to you. I think you instead of kind of, you know focused inwardly you focused outwardly. And decide to take action and moved on right? So that's commendable. DH: So it's 1988, February 1988, to be exact and you're home watching T.V. or do you say 'Telly' in Canada? I'm not sure. Or is just our British friends. You are watching the opening ceremonies on T.V. and you're watching these four Jamaican guys, these misfits walked in the Opening Ceremony. You are watching Eddie the Eagle marching with the British team, and perhaps worst of all though you're watching your friends. DH: Yeah! I mean what were you thinking then? VP: Well. Devon the truth be known I had a ticket for the Opening Ceremonies and I lived in Calgary. I was in the stands with a glove on holding a ticket watching these buddies of mine march in Opening Ceremonies. You know what? I'm not saying I know I would have made the luge team. I'm not saying that, I'm saying, I don't know! DH:[laughter] Yeah! You can't know unless you try, but then you know you got the coach to convince you not to. Because some stuff makes sense but this heart-stuff is what drives us. And I, and I hope this is correlating to people listening to this or watching this. You have intuition or what I call the emotional buzz. And the emotional buzz is based on when a thought creates a physical reaction. And there's actually science behind this. There was a study sourced by Dr Lee Pulos. I first heard it through him and he said in a second of time your conscious mind processes with two thousand neurons. But in the same second your subconscious mind below consciousness is processing with 4 billion neurons. So, two thousand conscious, four billion subconscious. Who's in control? Right? Your conscious mind might say, I want to go in one direction, but the subconscious mind might say, Nope, we’re going in different direction. I wrote a book called The Ant and the Elephant. The ant is the metaphor for the conscious mind. The elephant is the metaphor for the subconscious mind. How do you align conscious intention and the subconscious agenda? How do you get from where you are today, to where you want to go? And that's what this book's about. That's what life's about. How do we get to this oasis? Identify your emotional buzz. Create better results in your life. DH: Yeah! And you know you mentioned the guaranteed path, and I think all of us you know come to that crossroads in our lives, I think , where there's this kind of guaranteed path that makes you know like total sense. And then there's this other part that is being led by your heart right? And your conscious mind is saying I really want to go but you are not so sure. Your subconscious mind which is even more powerful and conditioned to go along the guaranteed path because it's meant to keep you safe. A lot of us unfortunately kind of follow that guaranteed known path, as opposed to following our mind. And getting our conscious mind to tell our subconscious mind to align because we're going in this direction. DH: When we do that as you said follow your heart, some amazing things happen. Not that you know going down the guaranteed path would not been good. DH: But I have found from my own experience is that varying off into the weeds because that's where my heart leads or compels me to go. DH: Create some amazing experiences right? I think that might be part and pass your thinking. This idea of self-mastery, life mastery which you teach a lot. VP: Yeah! The life mastery piece is being able to really understand how you can continue moving forward and not have regrets at the same time. It's like, it's the yin and yang of being able to go in the right direction. Being able to say hey, I've got a path that I would love to be able to go on. In the same breath I have security and safety that's necessary you want to feel safe. It's so much more consumable. I call it the mathematics of opportunity. Just open a door in front of your. Because when you open a door you look and you go, Oh! there's another door. Choose. Why don't you look at that door and then you just keep opening the doors until you go, wait a minute this is a great place to be. We're in a society of instant gratification and we want to get results quicker. And we'll hear a story like this recreational skier to Olympian in four years. Well you know what? That a was a long four years that was really hard. And it was uphill the whole time. You pace yourself. I mean it's life. Either you just sit in the sofa and watch Netflix and binge until you run out of popcorn. Or you get off the sofa and you say, What's on the other side of that door? DH: Yeah! But yeah, absolutely right. So you know the ying and the yang of kind following our desires or direction that our heart is pulling us in or pushing us in. Versus this kind of guaranteed path that we are all conditioned to follow right? And those are some of the similarities in our stories because you go from you know, having a successful real estate career. To kind of dropping it to go chase you know this hare-brained idea of being an Olympic skier in 4 years. Talk me through that, kind of your thought process. I mean it was a big risk, why did you take it? How were you able to pull it off? VP: You know what Devon, one story I don't really share that often because it complicates the elegance of a keynote . [laughter] It was the opening ceremonies in Calgary where this thing of regret was most intense. VP: But there's this notion that we make decisions like this blinding flash of brilliance or this epiphany. This Hollywood version of I know the direction I need to go and it doesn't happen that way with the human condition. Big decisions take time. It was months after I actually ended up going to the Olympics Seoul. And I was going to assist the athletes commission for the I.O.C. And I had more off time than I expected. I ended up going to the taekwondo event in Seoul. And the ticket lasted 8 hours, so I went when the doors open and realized this was going to go all day. I was a recreational skier and yet there was 2 things that really can help you when you make a decision like this. One was you just take a step and see what happens. Open that door. See what happens. The second piece of advice is, have fun. I'm not going to do this if this is not fun. I mean that was one decision I made very early on; at 26 years old. I'm not going to do this unless it's fun, and so making it fun and then looking at the next step. It all came together. It was amazing. And, most of all, do what the competitions not willing to do. That was great, a great way to be able to start to do things like; mental training, biofeedback and sensory deprivation, float tanks. Over two hours a day of mental training, things other athletes just weren't willing to do. DH: So you know talk about innovative thinking. A lot of times when I speak to kids and I show them how we train in Jamaica. Often say hey, remember that God gives you a brain and you're supposed to use it to think. And if you have a goal, as impossible as it might seem if you really start to dial back and think about all the resources that you have at your disposal, you can find a way to make some incremental progress. And even stepping outside the box a little bit, like as you did to get on top of a car. DH: What was that like? Not physically being on top of the car but you know, how did you arrive at that conclusion? That hey in order for me to train and have a chance to get a sense of what it feels like are going down the side of a mountain. I need to get on top of a car. I didn't scratch his car but the idea to get on top of his car and go to a remote part of just outside of Calgary and it was highly illegal. DH: I always say hey you know when it comes to taking risk and overcoming your fears. One of the things that you have to assess early on is that hey, if things go badly, like worst case scenario…..are you willing to live with the consequences? VP: Oh! I am, sure. DH: If you're investing in a business or you are switching cities because you need to change jobs or career and things go badly can you live with the consequences? If you can then it's a risk worth taking right? Because it's not just about blindly and unintelligently taking risk. And obviously you took precautions and I have to believe that somewhere in the back of your mind you were willing to live or not live with the risks. [laughter] With the worst consequences. VP: Yeah, from a very early age I've been a person that has as strived on minimizing risk. The safety industry is an industry that I work with quite a bit. Organizations want everybody to be safe and they gave them a stack of procedure manuals. But what really works is the neuroscience of safety. Being able to humanize the environment that they're in and say hey I want to go home to my family tonight. And so that's moving people forward and embracing it that way. It really is being able to have an emotional connection to where you want to go. And minimizing risk at the same time. And magic, absolute magic happens when you combine those 2 things. DH: I agree, let's stay on the subject of fear for a bit Vince. I tell people all the time I'm a 3-time Olympic bobsledder. I have driven sleds in the Olympic. I am not necessarily a fan of speed and height. [laughter] Yes, so it's kind of hard sometimes to make those correlation. But I certainly can remember the times when I am racing and I would get to the start line and the fear begins to creep in. Wow! You might crash, and I kind of see it as this other voice that I tell to shut up. Right? How do you deal with those moments? DH: How does dealing with fear in your skiing career, does that….do you see it impacting or affecting other areas of your life? VP: Yeah huge. Alright so I'm going to give you a technique that is phenomenal. Part one, you must have an emotional buzz of what you want to accomplish or where you want to go. It could be you know, having a cottage by the lake with no mortgage and hosting a family reunion there. In this Olympic story, it was marching in the opening ceremonies of the Olympics. Or your own business or living off a massive retirement fund. Or, in my case, a New York Times bestselling book it was being able to have you know hundreds of thousands if not millions of people reading this book and being transformed. Have an emotional connection to your goal. Now once you have your emotional buzz, then any time something that causes fear or let's just call it negativity right? Part Two: Any time there's negativity ask yourself, Is this taking me closer to that emotional buzz? Or further away? The negativity could be a comment somebody makes. Maybe it’s an internal dialogue that's going off that's saying Hey! hey! hey! hey! Wait a minute, you got to be safe can't do this. This technique is basically acknowledging the subconscious mind for throwing that thought, that fear out to you. VP: First you identify it as positive or negative. Helping or hurting you. Then you acknowledge it with gratitude. Finally, pivot from that fear to what, or where, you really want to end up. Is it that cottage that’s mortgage free with the family reunion? Or the New York Times bestseller? Marching in the opening ceremonies of the Olympics? Your new business? Your massive, retirement nest egg? Whatever that emotional buzz is for you. Go through the five senses. What does it look like? Smell like? Taste like? Touch? Sounds? You have an experience of all five senses and the emotion that's attached to that. Which would be satisfaction, or joy or gratitude. If you have an experience of what that is, you've completely eliminated any pattern of negativity. You’ve interrupted that negativity and pivoted on to where you want to go. DH: Yeah, you're making this strong emotional connection with where you want to go. That's kind of where your thoughts will eventually start centering and you get there. DH: Speak to me a little bit Vince, about what I am going to call your ‘Less’ philosophy you speak about fearless and selfless. Will you speak to me about that a little bit? VP: Yeah all boats rise, so to be able to be around people that elevate us through their character, these everyday heroes. I had people nominate their hero so that we would go back to the Himalayas climbed a mountain that had no name, and name that mountain after the everyday hero. And so the five qualities are: Compassionate, Selfless, Fearless, Humble and Persistent. Could we all be more compassionate? Could we all be more selfless? And have less fear? And to be more humble and persistent as well. Goodness gracious! That would be a phenomenal life lived if you had all those five character traits. DH: Imagine the number of people you would have impacted as well along the way. VP: Yeah! Yeah! So to live those character traits, I'm not calling myself a hero at all. [laughter] In fact, I'm constantly looking for people to draw inspiration from. And we named the mountain after a guy named David Maish. We call it 'Maish Mountain.’ In high school, he broke his neck playing football. He went on to be an Entrepreneur, Dad, great Husband. I have met him a few times. He's a phenomenal individual. His example is inspiring. We named another mountain after a young girl named Hana France. Hana was adopted out of Korea, kids were pulling out her hair, she had deformed hands. She went on to be a scholarly young lady. She's so inspirational. Then most recently we named a mountain after a young man that has overcome leukemia, Gavin Kilcullen. We named his mountain, Kilcullen Peak. DH: That's amazing! So we're wrapping up here. You're charging down a mountain you know, you are heading down the side of a hill. You're flying towards a speed trap, you're going well over 100 mph. You're focused, you're trying to stay stable you don't want to catch an edge. Because if you do you know, you're going to end up like that guy in that promo for ABC Wide World of Sports. You're going to be experiencing the agony of defeat. DH: Inside there, right? We all live and you wrote about the 'Age Of Speed'. That's the world we live in today, you lived in the age of speed going down the side of a mountain. We all are living today, everything is moving faster than the speed of light today. How do we stay stable Vince? How do we stop ourselves from catching that edge? So the question is 'How do you not become overwhelmed? And it has everything to do with being present and fearless at the same time. And being fearless we're all going to have fear, but to just fear less as we move forward. And being present means you're not worried about afraid of anything that happened in the past. You are not afraid of anything that will happen in the future. So to have those two things happen at the same time, means that you're going to be able to be happy. I went through a period of time where I was just really not happy. I don't know if you experienced it after the Olympics it's a bit of feeling lost. Be happy now, be happy now. And that made such a massive, massive difference. Then we have today in the age of speed we have to take more responsibility for technology. Meaning you got an iPhone it interrupted me while I was on this interview with you right? I mean frequent e-mail interruptions reduce your I.Q. two and a half times greater than the drop in I.Q. from smoking marijuana. [laughter] It’s like you're better off buying a bong than buying an iPhone. [laughter] And so you know, these interruptions of technology if we allow it to interrupt us, then we're not taking that stewardship for our time. That's another piece, it's just a process right? You just got to keep saying how can I make this better? How can I make this better? How can I make that better? You will get there! DH: Yeah. It's amazing and it's enlightening. It's been such an honor man to be hanging out with you, my fellow Olympian from Albertville 1992. DH: A guy who I looked at well you know I could I could do that. I'm not going to stand on my chair, when I'm not on stage, but you know I drew inspiration from you. DH: People ask me all the time hey so who inspires you? And it's everybody, I try to draw inspiration and knowledge from everybody. And so it's such an honor to have you here on Keep On Pushing. Because again I think you have being able to share some insights and some ideas, that are going to help our listeners get to the next level in their lives. VP: I hope so. I hope we all do that. I hope we can help each other. DH: Indeed! Indeed! So I am only a phone call away if you ever need a bobsledder. Not to go down a ski run [laughter] That's not going to happen. We will have anything else, it's all good. VP: Devon you are good man, and thanks for putting on this Podcast. It's good work, and you are making a difference one podcast at a time. So thank you. DH: Thank you so much. 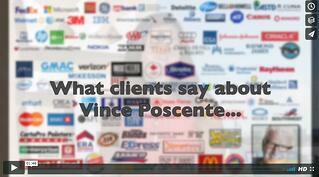 I am with Vince Poscente who is rated by Meeting Professionals as the Top Ten Motivational Speaker. He is a New York Times bestselling author who wrote the international phenomenon The Ant and the Elephant: Leadership For the Self. He’s an Olympian, could be a comedian and he has a lot of energy and personality. It’s nice to have you here, Vince. Thank you. I appreciate it. It’s good to be with you. You’re obviously an entertaining speaker. I want to know how you got to this level of success. Can you give a little background? If somebody said, “You got to see this movie,” you’d go, “Yes,” but if four people independently say, “You’ve got to see this movie,” you would go, “What is it about? What do I have to see?” I paid attention and then grew my business. It was very much a standing start. There was no momentum at the beginning because I was in the Olympics. There are a lot of gold medalists getting their phone ringing off the hook saying, “Would you speak to us?” but to be in demand to have that referral network where people say, “Would you speak to our group?” that came from improving as a speaker. Much the same way I did it as an athlete. You did it because you’re only one of four people on the planet to be inducted into the USA and Canadian Speaker Hall of Fame. That’s saying something. You’re a New York Times bestselling author of seven books too. You’re a busy guy. What was the most difficult book for you to write off all of those? Always the most recent one, they’re horrible. I’ve never given birth obviously. The gestation period in a book gets more and more difficult each time. I’m working on one right now. I won’t tell you the title but it’s a sequel to The Ant and the Elephantwhich is a parable about the conscious and subconscious mind. I’m working on that right now. They’re all like your kids. You get out there and you can’t pick a favorite. I found what you were talking about the ant walking one direction and then the elephant walking the other. Can you share that a little bit because I liked the subconscious versus conscious discussion you had with that? I went to a presentation by a guy named Dr. Lee Pulos. You know when you’re sitting there and then light bulbs go off? This guy said, “In a second of time, your conscious mind is processing with 2,000 neurons.” Right now, you’re listening to what I have to say. You lead by saying, “I’m very funny and I haven’t been funny,” and all sorts of things you’re thinking of consciously with 2,000 neurons every second. In the same second, the subconscious mind is processing with four billion neurons. The ratio between the conscious and subconscious mind when Pulo said is if you took a golf ball and put it on top of the Houston Astrodome. That would be the ratio of the conscious and subconscious mind. Mathematically, I took that down to what if you put an ant on the back of an elephant? There’s a more alliteration with that, it’s a stickier concept. I put that in my first book, that concept, about how we can have a conscious intention. You can consciously say, “I want to go on a diet,” but the subconscious mind might say, “No way, pal. Not without beer or pizza, I’m not.” It might have all these reasons why not that are unconscious. Consciously, in the parable in the book, the ant says, “I want to go west,” but it’s on the back of the elephant. It doesn’t see the elephant. If you’re an ant on the back of the elephant, you’re not seeing an elephant. You see just a gray landscape. It’s the same deal with our subconscious mind. We can’t possibly comprehend the power, the immense direction and agenda of the subconscious mind. In the same breath, what if we had alignment between your conscious intention and your subconscious agenda? The book, The Ant and the Elephant, is about creating the alignment of where you want to go with your life first. Where is it that you want to go? 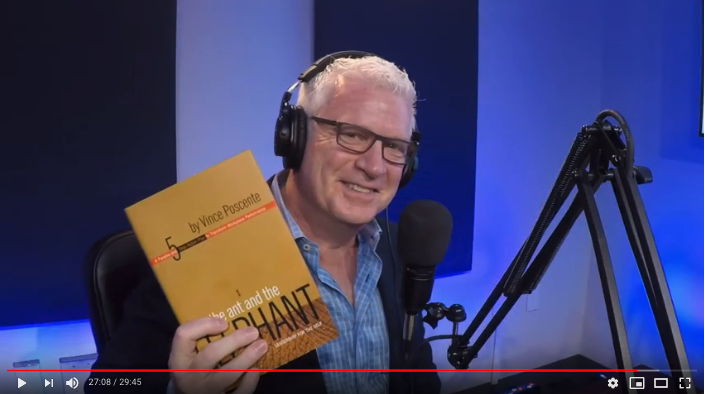 Identify that with what I call the elephant buzz, that thought that creates a physical reaction and then being able to get your subconscious mind to step in line. There is a technique and that’s how I got to the Olympics in speed skiing. I end up skiing 135 miles an hour not because I wanted to, but I wanted to go to the Olympic Games. That emotional buzz, the elephant buzz of marching in the opening ceremonies. First you identify it, which I did and then I went, “How are we going to get there?” Aligning your ant and elephant is critical and then it gets easier. What if life got easier? You said, “Where you want to go?” but a lot of where we want to go is impacted by our environment of what people have told us we should do or what we thought was boring, maybe we wouldn’t find boring. It’s impacted by our teachers when we’re in school or friends. How do you get over that to open up your mind to be more curious and successful? I split it into five C’s and let me go through this real quick because that will answer your question in the broadest sense. When you clarify where you want to go with that emotional buzz, you’re then going towards the second C which is commitment. Stepping towards something, you can be held back by all sorts of things that you are scared of, childhood wounds, limiting beliefs or all those subconscious things that exist. The commitment is less about a moment. Every Saturday, couples walk down the aisle and commit. That’s a moment in time. Commitment is a process. You have to step in and consistently step forward. Another way to put it, I call it the Mathematics of Opportunity. You go into a hallway where you are in your life and you see a door. Open the door and then look for another door. Open that door. Stay curious and that feeds into the process of commitment. The third C is consistency and then you’re in this process of consistency where you’re consistently executing. While I was racing, the philosophy was to do what the competition is not willing to do. If you want to know what your competition is not willing to do, it’s typically those are the things you’re not willing to do either. To look in the self-honesty mirror and say, “What are the things that the top, the highest performers are not willing to do?” I say the highest performers because this is back to the Olympic story. In order to qualify for the Olympic team, you have to be ranked top sixteen in the world or higher, at least where I’m from in Canada or the United States for that matter. What are those top sixteen guys in the world not willing to do? It changes the dynamic of what you do consistently from the heroes in business, the heroes in sport. The heroes in leadership are the ones that are working harder and the first one in the office and the last one at night. These are the people that we look up to that are working hard. Work smarter. The Olympic motto is, “Citius, Altius, Fortius,” which is, “Swifter, Higher, Stronger.” How about adding a fourth one which is Smartius? Why not be smarter in how you approach this? That’s under the banner of consistency. Consistently executing, consistently innovating, consistently doing things the competition is not willing to do. The fourth C is confidence. You can draw a direct line from confidence to outcomes. If somebody has high confidence, they’ll have peak performance or their performance will be higher and then you’re going to have better outcomes. What we consistently do is we always focus on, “I don’t have the results that I need. I need to change my performance. I need to do things differently.” That’s the case, but go further back and go, “What is my level of confidence?” If confidence is high and fear is low, you’re going to naturally have a better performance. Better on a sale or negotiation or speech you’re giving. For the leaders reading and the people you’re talking to and trying to get them going the same direction. If you have high confidence, you have better outcomes. That’s the fourth C.
You brought up a couple of things that are important to my research. I was talking about how we have environment or assumptions. You also brought up fear. I came up with four factors that affect curiosity and fear, assumptions, technology and environment are the four that I found. Fear is such a huge thing. You talk about fear of opening the door or whatever. How do we get that high level of confidence? How do you overcome that fear? That’s huge and it’s only getting bigger. The reason we have so much dysfunction in our world now is a confluence of speed, the volume of things coming at us and at the same thing with that volume is being able to say, “What could happen? The fear attached to that.” Confidence is very much attached to experience, but we don’t have the experience with the new marketplace or a new landscape that we find ourselves in. Political, interpersonal, everything’s changed. Without that experience, how do you have confidence? If you don’t have confidence, you don’t have peak performance and you have the outcomes that you’re unhappy with. Here we are in an insidious direct line to outcomes that aren’t optimal. Go back to the clarity and find out where is it you want to hit? What is true north for you? We don’t know how we’re going to get there. If you’re clear on that emotional buzz of that outcome you’d like to have, is it the family together in a family reunion? Is it a situation in the marching of the opening ceremonies? Maybe I set a goal of having a New York Times bestselling book, I said, “How cool would that be? I don’t know how to get there.” To be able to create confidence, one tool that I wrote in the book, The Ant and the Elephant, is the ant has a conversation with the elephant. Your conscious mind has a conversation with your subconscious mind only when it triggers with a negative thought. A negative thought is anything that takes you off course from the clarity, that outcome you’re headed towards. Let’s say a leader wants to be able to have a launch of a new product that is going to be in the media and everybody’s going to be talking about it. Everybody’s going to be excited and it’s going to be the new new thing. Let’s say a thought comes up and says, “We don’t have the budget for that.” The conscious mind says to the subconscious mind, “Thank you, but that’s not part of my vision. My vision is,” and then you go back to the exact scenario that you painted in the first place. How cool would it be? The launch, the media attention, the new new thing. You’ve interrupted the negative thought, the fear and then pivoted onto the emotional buzz. Every time you pivot onto an emotional buzz means that you have aligned 2,000 neurons and four billion neurons at the exact same time. The physical reaction from a thought is a litmus test for your ant and elephant headed in the same direction. The more you keep those four billion neurons aligned with your conscious intention, the easier things will be and the more things will manifest and appear. They show up. Somebody gives you a phone call and makes it happen. It works out that way. How do you use that to become a New York Times bestselling author? How do you get there? I brought in my publisher then I brought in a publicist who’d worked with John Maxwell and Marcus Buckingham and big authors like that. I worked over with a publisher who probably in the last few years had about fifteen New York Times bestselling books. I assembled this dream team and not because I knew that I should upfront. I said, “If we got the concept, we got The Age of Speed, we got the publicist, what’s next?” I know a guy and it’s like, “Boom.” Things in motion tend to stay in motion. Why don’t you be the architect for the direction of that motion? Most people aren’t. Clearly define what the big puzzle piece looks like, smells like and tastes like. When I talk about a direction you’re headed, when I say clarity of vision, I wish I never said that in the book. It’s more than a vision. You’ve got to smell it and taste it. You got to bring in the five senses and then the emotion attached to that. That’s something I’ve come up within the last few years. I call experiencialization. Experience it. Experience the entire physiological. The smell, the taste, the touch and then the emotion attached to that. That makes it clear to the subconscious mind, the elephant, where it is you want to go. If you’ve got four billion neurons working in the same direction as your 2,000 neurons every second, who are you to say, “How do I do that New York Times bestselling book?” Get out of the way. Be in that state and that direction. Thank you, that’s not part of my vision. Pivot and then you go back onto what that outcome is. It’s less about what you do and more about the state you’re in and then people follow you. People follow people who have a passion for where they’re headed. Look at the political races. Look at the debates that are happening. The people who are most passionate about where they’re headed are the ones who are most appealing. That’s an interesting aspect of what you were talking about. You have a lot of passion for what you do. Your prior background was a VP of Marketing International Investment Properties. You had this award-winning sales career. I’ve been in sales for many years and different aspects. How much is that foundational to your success to have a sales background do you think? I’ve got three kids. They’re now 21, twenty and eighteen. From day one, my wife’s an entrepreneur. I’m an entrepreneur. We knew that they will succeed based on how well they communicate. There’s a saying, “If your lips are moving, chances are you’re selling something.” Connect the dots and say, “How well can you communicate? How confident can you be?” All three are extraordinary. The oldest is at Berklee College of Music. He’s dropping an album. We don’t finance any of what they do, by the way. It would be easy for us to write a check and say, “We got your back,” but my son, example, wanted to release an album. He has to hustle. He went to these top studios. One in Seattle, one in Dallas and one in Boston. Each of these places he was going to school at and he said to the studio owners, “I got this job at this hotel where I’ve got the midnight shift. At the end of this week, I’m going to make $400. If I give you $390 and I keep $10 for food, would you?” These studio owners knowing in the back of their mind they charge about $10,000 a day. They’ve got a 21-year-old so passionate and so specific on what he wants to create and then he’s making it happen. You do have to lead by example. We each knew. Do what you want. I know in my life that I have to lead by example. If I lead in a way that has people go, “That’s the way we’re going to make it happen.” Our middle child, she’s at Wharton School of Business. She went to an arts magnet school. She wasn’t your prototypical Wharton-type kid, but she gets after it. The reason she beat out 39,000 other kids is that she was deliberate on where she wanted to end up and had an emotional buzz attached to that. The youngest is a dancer. That’s amazing that your kids do such interesting things. You do a lot of interesting things. I was in a rock-climbing competition and I found that you’re the Founder of the Heroes Climb Initiative, climbing and naming mountains after everyday heroes. You’ve participated in six Himalayan expeditions. You’re super athletic in all aspects. Yes and no, but I’m more curious. If you looked at me, “You look like a chunky version of Anderson Cooper. You don’t exactly look like an athlete,” but I play beer league hockey. You’ve brought up all these things and I sound like an overachiever. I’m more curious. Everybody thinks about what I do. I don’t do it for the accolades. I put it on the bio so people can feel good about hiring me as a speaker. Make it about your audience. What are you going to do to create that emotional buzz? What are you going to do to commit and step up? What are you going to do consistently? How can we break it down and make it happen? Your podcast, your radio show, you have such an opportunity to reach out to people and truly transform people by the people you interview. That’s extraordinary, the privilege you and I have to get out there. That’s probably a lot of my goal with this. You talk about emotional buzz. My dissertation was in emotional intelligence. I’m fascinated by how much emotions and all the things that we learned just being in sales like you were. We have a lot of similar background things. I’ve never been to the Olympics to that extent, but the sales background and some of the stuff that we have in common. We learned a lot about the lack of some of the emotional intelligence that was out there, at least I did. I was a pharmaceutical rep and saw a lot of doctors. It’s interesting to see all this training. Are you seeing people improving? What has been your experience? You’ve had some of the hugest clients. Your list is a who’s who of who you’d want to have to consult and speak to in the world. Are you seeing that we’re getting better at our emotional intelligence, our interpersonal skills and all the things that fall into the soft skills area? What are you seeing? I see us getting worse on one level and it’s affecting everything. It’s this absolute determination to be right. The people are jumping up and down and sticking their feet in the ground and saying, “This is the way it has to be.” That is a lack of emotional intelligence. That is a lack of empathy. It’s creating a conversation. In one breadth I see things getting better. I don’t know if it’s just the kids I’m seeing around me. I speak to some youth groups at times. I am so optimistic about the future. I see so many aware people out there that the default to say, “What’s wrong with Millennials or what’s wrong with Generation Z?” This optimum comes from the awareness that people are going, “What if I’m not right? What if you have a point of view?” We had this little aside. When we’re doing this interview, the midterm elections in the US are coming up here in the next few weeks. We decided to watch one of the big debates between Ted Cruz and Beto O’Rourke. We had a drinking game attached to it. What we did was every time Cruz said, “Hillary Clinton,” we’d have to drink a beer. Every time Beto does say, “I’ve been to 254 counties in Texas,” you’d have to slug a beer. The reason I bring that up is we created an environment to have a conversation. We paused the TV and then we talked about something. We had Republicans and Democrats in the room and people and kids. Not from Canada, but what am I. I’m not either. I just moved here. I don’t have a predisposed political party that I have to be a part of. To create that dialogue, to put yourself in an environment where people are talking and being aware. Three of the people in the room were under 25. Part of their discussion was enlightening. To shift from being right to shift to having a conversation, just communicate is critical. Creating a dialogue is important and that’s what I’m trying to do with my work. A lot of what you do is important. Your books have been unbelievable. I’m looking forward to the next one. I’m wondering if it’s going to entail that word that you created. It was wonderful having you on the show. A lot of people are going to want to know how they can get your books or find out more to have you speak and all that. Vince, could you share that? My website VincePoscente.com will get you there. You can go to AntAndElephant.com and you’ll be able to find me that way too. One way or another, hopefully, they’ll find your work. It was nice having you on, Vince. Thank you so much for doing the show. You’re a true pro. Keep it up. Your brain is a complex and powerful tool. To best explore the potential of your brain, let’s first study its evolution, properties and characteristics. As far as evolutionary scientists know, the human brain evolved in three main stages. First, the Reptilian brain, at the innermost core, is the most ancient and primitive. It is located at the brainstem, near the top of your neck. It controls many of your body’s instinctive functions, such as breath- ing. Next evolved the Mammalian brain with new functions and ways to control the body. It also controls your emotions, your sexuality and is a key component to memory. Then evolved the neocortex, the gray matter, as the third part of the brain. You use this portion for talking, seeing, hearing, thinking and creating. This “human” brain is the bulk of the whole and has two symmetrical hemispheres which communicate. These three brains interconnect and determine human behavior. The left and right hemispheres are often talked about, though not always understood. The detail-oriented, verbal and sorting side of the brain is on the left. The intuitive, spatial, non-verbal side of the brain is the right. To best remember this, learn that left is logical and right is creative. Both sides are connected by the corpus callosum and this is the actual pathway or switching system for information exchange between the two hemispheres. When these different aspects of the brain integrate, learning is much more profound. Within the brain there are six intelligence centers, each having different functions and interrelating in thousands of ways on a constant basis. Finally, there are three key relay points that are often referred to as the three gatekeepers. The Amygdala: relays the instinctual fight-or-flight reaction to various parts and organs in the body. At birth we are born with between 100 and 120 billion glial (the Greek word for glue) cells or active neurons in the brain. In fact, you could put thirty thousand neurons on the head of a pin, and they would not touch. Around the turn of the twentieth century, William James discovered that we lose the use of roughly 90 percent of our active neurons. This natural process, called pruning, actually strengthens the neuronal connections by reducing the interference and leaves us with 10 billion neurons, a number more than sufficient. This fact is responsible for the general consensus that humans only use 10 percent of the brain. Nature’s way of improving the efficiency of the brain is to refine thought processes. This is the reason for the profound importance of childhood experiences. A majority of the pathways and connections are sculpted in the early years. It is understood that by the age of six much of the way we think and will learn is firmly established. Each active neuron in the brain has up to twenty thousand different connections (dendrites) with other cells. In his book, The Amazing Brain, Stanford University professor Robert Ornstein says that the number of connections is probably more than the number of atoms in the universe. I repeat, more than the number of atoms in the universe. Sound incredible? Consider what happens if you took only ten everyday items—like the first ten things you did this morning—and combined them in every pos- sible sequence. The result would be 3,628,800 different combinations. Take eleven items, connect them, and the number combinations is (ten- fold) 39,916,800! So now try combining 10 billion cells in every possible way—when each one can make up to 20,000 different connections—and you get some idea of the creative capacity of your own brain. You have one mind, but it is separated into two distinct functions—the objective and the subjective mind. In other words, the conscious and the subconscious act as the waking and the sleeping mind, the voluntary and the involuntary mind, respectively. The primary use of the conscious mind is what you currently, logically embrace as your thinking mind. The subconscious is actually the engine, drive train and central computer system running the whole thing. Moreover, the conscious mind knows what is real and what is not. The sub- conscious mind, on the other hand, takes in information as fact. It does not know the difference between real and surreal. Research by Dr. Lee Pulos from Vancouver, Canada, has uncovered that in one second the subconscious mind uses 4 billion neurons all at once. In that same second the conscious mind uses a paltry two thousand neurons. That is a massive difference. Imagine a tiny fire ant on the back of an African elephant. The ant would be the conscious mind. The elephant would be the subconscious mind. As you read this book, you are reading these words with your conscious mind. You are processing the meaning and storing it with your conscious mind directing this informational traffic. Yet your unconscious mind in the very same second is guiding all bodily functions, keeping your balance, monitoring your body temperature, processing things that happened in your life, repairing a bruise, fighting a virus, thinking about tomorrow and the list goes on. If at any given time you think that you are in control, think again. Let’s say you look in the bathroom mirror and decide (with your conscious mind) to go on a diet. Meanwhile the subconscious mind might be programmed very differently. In fact, you may have a myriad of subconscious reasons why going on a diet is a bad idea. Which way is the ant really going? South! Here is another example. A sales person decides to make more money. A year later, she looks at her commissions and sees the same production as the last two years. She wonders why. When you can get the ant and the elephant to go in the same direction, the result is success—success that is often beyond your expectations. In some cases, the subconscious mind knows exactly how to set things right. There, now you know about that noodle between your ears. What you do with it has everything to do with the choices you make and how you align your subconscious agenda. Look to ELEPHantPOWER micro-learning in the column on the right for the way to align your ant and your elephant. YOU WILL GET THE FIRST FEW MODULES FOR FREE. Communication skills (for a motivational keynote speaker or anyone else with a platform to present) stick with your audience when you integrate both the "good cop" AND the "bad cop." This isn't about the threatening our captive audience. Nor is it about coddling them. "Good Cop, Bad Cop Presentation Skills" happen when you're message makes them comfortable AND uncomfortable. People learn best when they're at ease or uneasy. Obviously, our most profound life-lessons occur when hardship hits. But don't discard the lessons in blissful, joyful, loving and peaceful moments. We're on this planet to learn and grow. 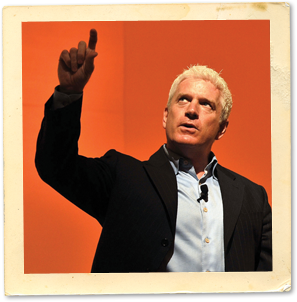 If you can optimize learning, whether it is as a corporate speaker, leader, parent or a true friend, then lets make the most of your "sticky" messaging. The presentation technique involves both discomfort and comfort. For example, I will regularly challenge my audiences to look in the self-honesty mirror. "It was Enterprise Fleet Services." "Seriously, be honest with yourself. Find ways to do what the competition is not willing to do. Own it." 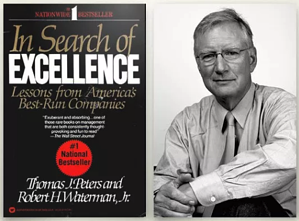 Tom Peters, author of In Search of Excellence, did a legendary 'bad cop, good cop' poke at the Canadian Postal Service. As the story goes, Peters was called to the stage by his introducer. The curtain did not part. There was instantaneous discomfort. The audience squirmed. The introducer had no back-up plan. The AV team dove for filler music. After an agonizing few minutes, Peters walked out to center stage. The music went down and he opened with, "Based on your standards, I'm on time." Of course, Peters went on to wow the audience with his direct style and corporate content. But, he wasn't there just for the audience to like him. He was there to deliver a return on investment. In this case, the fee paid to Peters by the Canadian Postal Service. Double the impact with your messaging with feel good stuff... PLUS, add in some uncomfortable stuff, and your message will truly be sticky. Author: Vince Poscente. His motivational keynotes help audiences overcome obstacles and maintain resilience, while having fun along the way. He draws from his background as an Olympic Competitor, New York Times Bestselling Author, Hall of Fame Speaker and second chair clarinet player in his high school band. Challenge your own self-motivation. Take yourself to task on what you could do to raise your own drive to succeed. With one toe on the side of sarcasm and the other foot planted firmly in You-Best-Pay-Attention; noodle on this saying: "Go Now. 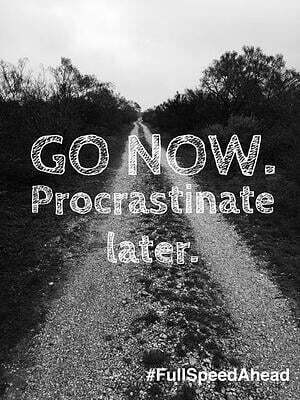 Procrastinate Later." Let's take a deeper look. Mr. Imai offers ten basic tips for kaizen activities. Let's combine these with a way to procrastinate later, and you have a way to amp-up your self motivation starting immediately. Think of a project that is weighing on you right now. Tip #1: Discard conventional fixed ideas. Move forward to definable goals. Do not focus as much on the path to get there. New opportunities and new directions may occur to you along the way. Raise your gaze. Tip #2: Think of how to do it, not why it cannot be done. “Realistic” is a dangerous word. Instead, by knowing that the outcome would be desirable, hypothesize methods to accomplish this goal. Tip #3: Do not make excuses. Start by questioning current practices. Again, focus on the outcome. Excuses will not take you there, but acting on the means to the end will. Do not be afraid to make mistakes. You will learn more by failing. Tip #4: Do not seek perfection. Do it right away even if for only 50 percent of the target. For example, four months after having the idea to write my first book, it was done. I did not wait to start. I did not wait at each stage. Of course, I wanted the book to be perfect, but that would never be. Along the way, implement tip #5. Tip #6: Do not spend money for kaizen; use your wisdom. How much do you know about the way your car is repaired when you take it to a mechanic? Chances are, nothing! When you seek to personify proactivity for your own pursuits, then you must be proactive. Remember, however, some of the best solutions happen when you pause, stand back and think. “Just Do It” is not about blindly charging ahead. Plan. Take ownership and move yourself through the process. Tip #8: Ask “Why?” five times and seek root causes. Each time you ask why, come up with a new answer. Go deeper with each answer. You will surprise yourself. Tip #9: Seek the wisdom of ten people rather than the knowledge of one. Remember a person’s perspective is their truth. You will learn ten truths versus just one. Tip #10: Kaizen ideas are infinite. You never “arrive.” You are in a process of learning and growing. Always seek higher ground. If you scanned this article and didn't truly reflect on a project you are struggling with... STOP. Take a breath and ruminate on each of the ten tips. Pay special attention to Tip #8. Stop procrastination at its fear-based source. Go now! Entropy is a component of the Second Law of Thermodynamics, which states there is a general tendency of all observed systems to go from order to disorder. This law was developed in the context of 19th century studies of steam engines. It was learned that energy spent is energy lost. Any and all energy that is used must come from somewhere. The net result is energy gets used up until there is none. Taken to the extreme, in billions of years, the universe will simply disintegrate into a mass of nothingness (hmmm… not something to look forward to). Growth, on the other hand, is the force of life. In many ways it seems to contradict the force of entropy. However, life stands out as a profound pesky nuisance to the Second Law of Thermodynamics. Humanity is made up of individuals. We evolve as individuals and thereby evolve as a society. Through our recorded history and evolutionary past, uncovered from the Earth, humanity has arguably improved and grown. We know more than generations past. We live longer and “better” lives along the way. Where, then, does entropy fit into the picture? A body of philosophers, scientists and theologians have yet to agree on an answer to this question. I, for one, will not join the debate. Suffice to say—we tend toward higher ground. Individually, we aspire to ascend Maslow’s hierarchy of needs from food and shelter to self-actualization. Ultimately, this ascension will only happen through the choices we make. Proactivity over passivity will deliver us to that higher ground we seek. There are times when we follow the flow of entropy. One classic example of this is by becoming a victim of a situation or circumstance. As “victims” we are stuck. In victim lies chaos. Victim follows the entropic flow. But if we take responsibility, or as Stephen Covey called it, “the ability to respond,” we will then act from a place of accountability, a place of choice, power and self-determination. We then personify proactivity. The modern Olympic games were revived in 1896, by the French aristocrat Baron Pierre de Coubertin. 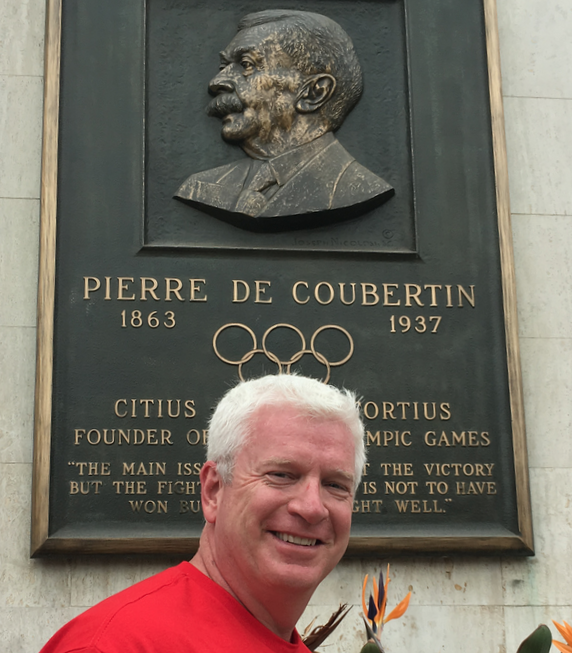 As a philosopher and academician, de Coubertin led a group of colleagues to found guiding principles for the Olympic Games. They set the standard with three Latin words: citius, altius, fortius—swifter, higher, stronger. They purposefully did not use the words swiftest, highest, strongest. The pursuit of excellence involved personal bests, peak performance within the individual and on the sports field. De Coubertin and his colleagues ensured that the foundation of the Olympic movement reflected the ever- present potential for humanity’s quest for excellence—not perfection. With sport as the backdrop, citius, altius and fortius celebrated humankind’s potential. Olympians do not have the exclusivity on excellence. Citius, altius, fortius (and even smartius) are principles that everyone can follow. We can physically learn to quicken our reflexes, reach new heights and strengthen our bodies. We can learn and grow in many ways. Then what must we do? Choose to do one hundred things one percent better, rather than one thing 100 percent better. Personify proactivity in all things that you do. Do not look for leaps of excellence. Instead, apply excellence to everything. You will then discover that your path to excellence is the way you will embody the philosophy of kaizen (continuous improvement). Kaizen works both personally and professionally. The growth of individual employees leads to corporate growth. Over the past couple of decades in Japan, despite the implosion of Japanese banks, the challenging roller coaster of the Nikkei stock market and the uphill battle their businesses have faced, the Japanese remain steadfast to kaizen. Matsushita-Panasonic has 6 million staff suggestions a year. Ninety percent are put into action by a company-wide day-by-day approach toward continuously improving results. Toyota Motor has a system whereby 1.5 million suggestions are processed each year and 95 percent of them are put into practical use. Nissan management seriously considers even the smallest detail. “Any suggestion that saves at least 0.6 seconds—the time it takes a worker to stretch out his hand or walk half a step” is reviewed and integrated into operations. Bottom line, look for ways you and your organization can continuously improve. In life, beating entropy with kaizen is the way to go. Be a seeker. Leading a life of total dedication to the truth—this makes you a seeker, a person of curiosity and wonder, a person of hope and ever-increasing levels of wisdom. Yet “truth” is an interesting word. There are challenges and problems in both positive and negative situations. As a seeker, you treat these as opportunities. By learning, you will open yourself to challenges in a way that welcomes change. But we naturally avoid challenges. Thus, we must find ways to make the unnatural natural. Our instincts will tend to direct us to safety. We naturally choose to limit our growth and give in to security. It is there we stay, and it is there we begin to disintegrate. In the words of T. Alan Armstrong, “If you are not getting better, you are getting left behind.” By growing through a dedication to truth and openness to challenge, you will consistently find ways to improve yourself. This is likely one of the reasons you are reading this blog. The future is yours to do special things. Be the creator of the journey toward life mastery. You will discover that Personify Proactivity is a philosophy of how you approach life. In turn, the results and rewards you get will be in direct proportion to the degree that you actually personify proactivity. The Japanese have a single word to define this approach. It is kaizen and stands at the very core of their culture. Mr. Masaaki Imai was the first person to introduce the word kaizen to the world beyond Japan. He is the author of KAIZEN, The Key to Japan’s Competitive Success. In bringing this single word to the forefront of personal and corporate development, he managed to hit a nerve. Individuals and organizations realized that the advantages the Japanese brought to international marketplaces were founded in kaizen. Since people naturally seek higher ground, kaizen, when framed properly, is natural to the individual. Pushing through fears and self-doubt, backed by a kaizen approach, we discover that all circumstances are opportunities for constant improvement. In these ways of seeking a deeper truth and constant improvement will we each personify proactivity. What were the best five years of your life? The ideal answer is—the last five. Starting today, what will the next five (best) years of your life hold? These blog entries, internalized and used on a daily basis, will help you create the pathway to life mastery. The book, The Alchemist, is an inspiring collection of experiences by a young seeker who looks for his fortune and finds himself along the way. Prevalent in the book is the importance of signs and omens that should be paid attention to. With that in mind, I look back to the time when I just graduated from high school. I finished a summer job working on a ranch and was preparing for my first year of college. It was an unseasonably cool fall evening and the sky was filled with millions of crystal clear stars. I was inside and, as was my habit, I had gravitated to the fridge to see what there was to eat. My mom was tapping on the window. "Quick, come outside. The Northern Lights," she said, referring to the Aurora Borealis. The Aurora Borealis is a phenomenon of ions in the atmosphere that react to sun flares. The undulating river of light appears to be thousands of slivers of light clashing and shimmying and putting on a different show each time they appear. The displays are never the same time, never the same place, and never expected. They are nature’s nocturnal gift to anyone who happens to look up for the brief moment they appear. Growing up in Canada, I would often see the Northern Lights as a youth and imagine it was a reflection of the sun bouncing off the polar ice cap—the dancing lights a result of the floating ice where the polar bears lived. Sherwood Park, in northern Canada, was an ideal community. At the time, it was a private hamlet of just over thirty thousand people, yet it was close enough to enjoy all the conveniences of a larger city, Edmonton. On this particular night, there was zero humidity and any city lights that shone went directly into the heavens. I dashed outside, not hesitating to grab a jacket since I had no idea when “the show” had begun nor when it would end. Cranking my head back, I saw lights were more vibrant than I had ever seen before. Despite the street light fifty yards to the north, I could easily make out the bright band of lights rippling like a snake. It was as if an impressionistic painter had found paints of light-colored white, yellow and glow-in-the-dark green. It moved and shifted, shooting off strands from one horizon to the next. Its magnitude grew and it seemed as though it was gearing up for something big. Then in an instant everything changed. The colors of red, purple and magenta added to the existing lights and flashed into a spiral directly over- head. It was as if I were looking at a satellite picture of an instantly forming hurricane created by the dancing strands of the northern lights. The strands themselves changed from a two-dimensional up-and-down to a three-dimensional in-and-out. Imagine millions of fine, ubiquitous, undefined strands of angel hair bobbing in and out of the atmosphere. Like a sea of light beams floating on a swirling ocean. It was awe-inspiring! The vortex of light began to wind up tight directly overhead. Then, just as quickly as it appeared, it changed again. Now the swirl appeared to spin downward directly down on me. A spiraling tunnel of light started to descend over head. My Star Trek infested imagination entertained the thought of being beamed up. I was frozen in place. I couldn’t believe what I was seeing—what I was experiencing. Then the tornado-like funnel stopped descending. It paused, and time seemed to grind to a halt. I held my breath. There was no sound. A moment later the light danced all around, in all directions. The vortex of light dissipated into a cacophony of light across the whole sky. Like the 1812 Overture, the heavens danced and the show was over with a dramatic flash. The experience left me vibrating. I just stood there trying to make sense of what had happened. I never forgot that moment, and my life has been an effort to meet that challenge. As you read past blog entries or future ones, you will find a collection of research and personal experiences. I have been fortunate to stand on the shoulders of giants and integrate their research with mine. These inspirational thoughts are intended to touch you logically and emotionally. They are meant to spark a long-lost thought. They are designed to fire a desire within you to evolve in bigger and better ways. Like you, I am a work in progress. Probably the best time to write anything I have published would have been a few decades from now. That way you would have recieved a collection of thoughts and research with a broader background. But the next best time to write these insights is right now. Take what you want, learn what you can and apply what inspires you. Most of all ... act. 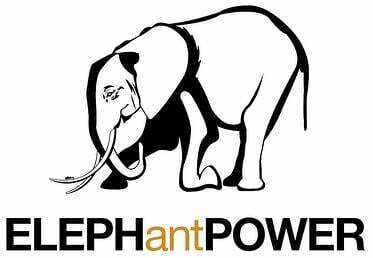 To help you be everything you hope to be, we have created an on-line program called ELEPHantPOWER Virtual Coaching. In 4 weeks you will gain superior Clarity, Commitment, Consistency, Confidence and Control. Create the future that might even be beyond your expectations. Click here to learn more... To get a $100 discount, use the code BigFastGoals. In the motivational keynote speaker world we often wonder why our quality keynote speaker videos are not getting so-much-as-a first-look. Our well-thought-out speaker submission is not getting through. They "chose a different keynote speaker" or "went a different direction." Does this sound familiar in your business? What are we missing? It's a recent phenomenon we call the Millennial Bottleneck. A few factors are at play. In particular, it's human nature to follow the crowd. 70% of buyers seek other's opinions before buying. BUT, get this... the percentage jumps to 82% with Millennials seeking social proof. Like you, we're not new to our industry, yet a bottleneck that USED to be focused strictly on quality is now turning it's eyeballs to social evidence first. And those "eyeballs" (at the 'gate-keeper' phase), we're finding, are predominantly owned by Millennials. What can you do to get more business? #1: Beef Up Your Social Media Image (especially LinkedIn and whatever appears on the first page when they search you). When you Google your name and company are you looking at the first page from the eyes of a Millennial? #2: A Killer 1st Impression. Be sure your product or service (in our case, a business keynote) you suggested has equally good social proof. Click here for and example of what we do. 45 sec video eg. Popular with our clients. Look through the Millennial lens and reduce the amount of business you lose. It is time to stop playing small. Help you reach your big goals in short order! Join me and be the architect of your life. You will experience a program that Will Produce Exceptional Results. These lessons really stick. I was able to create bigger goals and improve my self-confidence. I now have a platform to build on going forward. At work I focus on achieving better performance that leads to better results." '' Compared to other coaching programs I've taken, this was more intense and required a daily commitment and accountability with my co-workers. It was very engaging and thought provoking. I was able to identify my self-doubt and move forward. I have control!